Think about the last time You were arguing and You felt certain that You were right and the other person was definitely wrong. It’s likely that You can pick from a laundry list of arguments with your spouse, family, co-workers, or friends. When You go deeper into this it might make You start asking questions like “How can Jamie be so sure that she’s right, when I know that I am right?” The key explanation is we are all looking through our own filters or lenses to see the world and process information. Our individual filters tend to fool us into believing things are TRUE and therefore the other person is wrong and out of left field with their beliefs. Giving the other person the benefit of the doubt and looking for positive intent behind their position will enable You to see they are expressing things the way that they believe them to be. Once you can look through someone else’s lens at a situation, You start breaking through on better communication and finding middle ground more often. The next time You engage in a confrontation, ask the other person what their intent is, then keep asking questions and encourage them to tell You more. Before responding with Your opinion, recite back to them the facts as You heard them. Make sure that they acknowledge/accept your play back of their words and feel validated. Now, ask one more question. “What is your desired outcome”? More often than not, You will be armed with a clearer understanding of the other person and what they hope to accomplish. The funny part is that as Your perception changes, Your reality changes, and so will the productivity of the conversation You are about to have. 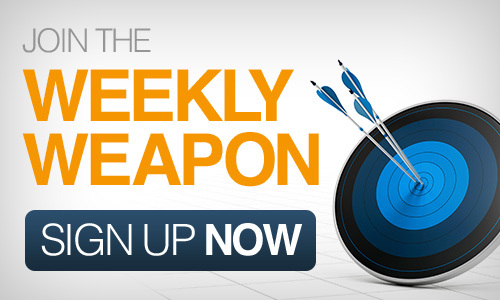 This entry was posted in Your Weekly Weapon With David Farbman on February 14, 2014 by David.